Twenty-four hours. Three cities. One community. 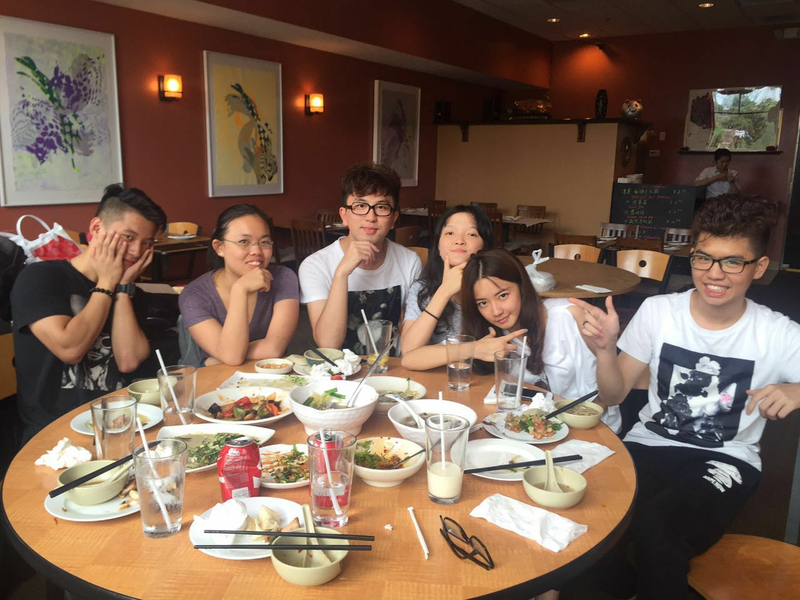 Editor’s Note: The following is a first-person account from Arthur Wang, a senior English major from Kunming, China, pictured in the center of the image above. International travel rarely goes as planned, and Arthur and several other international students learned that firsthand just two weeks ago. This was many of the students’ first time in the United States, and concern started to settle in as to whether they would make it to Erie. However, they banded together and found a way. Arthur shares their story below. My heart began to sink when I received an email from the airline company announcing that my flight from Chicago to Erie had been canceled due to mysterious “air traffic control conditions.” After a 14-hour international flight, I was hoping to spend the very last teaspoon of my energy on another two-hour domestic flight back to Erie, with my sophomore Italian friend Wen, move into my reserved hotel room, enjoy a hot bath, and go to sleep. Of course, things that involve international-domestic flights never go easy. Wen had been at O’Hare International Airport waiting for my arrival; she met Lang (Mike) Mai, Runzhong (Terk) Tan, and Suiya Zhou, three freshman Chinese fellows whose flight to Erie was also canceled. A natural-born leader with phenomenal problem-solving skills and a generous heart for helping others in need, Wen already explored all possible solutions, sought assistance from the airport staff, and messaged me with some new “workable” ideas. When I landed in Chicago with Kerun (Elodie) Chen, another Chinese girl who had suffered the same flight cancelation, I was thrilled to discover that Wen had prepared two plans. Plan 1: Cancel our flight and request a reasonable refund; take an overnight, 9-hour train to Erie. Plan 2: Stay in Chicago for one night; rebook the flight to Cleveland for the next day; take a bus, a train, an Uber, or whatever transportation was most convenient to help us return to Erie. As Wen and I were deciding that the second plan might be a better option because one night on the train would be “too much” for all of us, I sensed immense frustration among the four new students. I then realized that this was perhaps their first time traveling abroad on their own, experiencing a horrible flight cancelation in a foreign country, and having to initiate a handful of communication not conducted in their native language, without any family or friends there to support them. Becoming aware of their panic, I assured them that all of us would cooperate as a team, and that no one would be left behind. A natural sense of unity began to manifest itself, with everyone knowing their duties: when I was holding everybody’s passport and waiting for rescheduling our flight, Mike and Terk took turns to accompany my side, ensuring that I stayed energized. Wen, Elodie, and Suiya came back with bottled water and snacks after we sent them to eat dinner. While I negotiated with the shuttle driver over the phone, the rest of the peers started to move the fourteen suitcases to the pick-up lot. Yes, the six of us had fourteen pieces of gigantic luggage. Then, when we were “squeezed” into one taxi vehicle with all luggage, I observed that everyone, the four new fellows in particular, was laughing and joking around, creating a warm and relaxing atmosphere. I knew that we were all exhausted, but none of us revealed it. We remained sanguine. The sense of unity continued to grow and expand the next day. Prepared, all of us went down to the hotel’s lounge at 3:30 a.m. and waited for the shuttle to take us to the airport. No one complained about getting up so early or not having enough rest. After we passed the security check at 4:45 a.m., Elodie, Terk, and I volunteered to buy breakfast while Mike, Suiya, and Wen went to find seat. Wen even acted so quickly by booking us six greyhound bus tickets right before we boarded our flight to Cleveland. Upon arriving in Cleveland, I had consulted a friend and had found an authentic Chinese restaurant to invigorate us all – what could be more soothing than a wild food hoopla after an endless travel? And, in large, what could be more effective than sharing a meal together in terms of enhancing our friendship? The meal was beyond gorgeous, though we did stun the restaurant’s waitress when we showed up with our fourteen suitcases. Then, as planned, we took two Uber vehicles to the bus station, arrived there on time, and managed to leave Cleveland promptly at 1:30 p.m. Wen and I also negotiated with our hotels to request extra beds in our rooms, so that the four freshman fellows, whose hotel reservations had been canceled because of all the travel changes, were able to stay with us for the night. While on the bus, Terk asked how I would react if I were in their shoes, being the first time in a foreign country and having zero experience handling situations like this. I jokingly teased him that I would probably cry a river at the airport. Laughing at my goofy response, Terk and Elodie genuinely expressed that they appreciated everything Wen and I had done for them, that they could only imagine what would have happened if they had not met us, and that they already felt a community being formed among us. The word “community” inspired me. Though it has accompanied me throughout my journey at Behrend, I haven’t had a chance to let it marinate in my mind: I heard this word the first day I came here. I heard it in all kinds of student meetings and celebrations. It also appeared repeatedly in many GenEd and major classes I had taken. Surely, the word “community” includes various meanings, or more precisely, layers of meaning depending on the context. However, one insight I could draw from this particular experience is that behind the word “community” is a powerful bond, one that is not necessarily determined by the similarities we have, like our Chinese background, but by the collectivity we share, such as the Behrend identity that glues us together. This is how the six of us traveled between three cities within twenty-four hours, carried fourteen suitcases, and eventually formed a Behrend team long before we actually arrived at Behrend. And what a team, one that is truly a community.